Luis Godinez, a technician at SCE’s Advanced Technology lab in Pomona, hooks up hoses to a portable machine that will measure emissions from the converted Chevy 1500. SCE engineer Ed Kellogg calls this diagnostic machine an “air quality lab in a box” that measures the emissions from this converted plug-in hybrid electric Chevy 1500. SCE engineer Ed Kellogg (right) plugs in the connection for the external generator while Luis Godinez hooks up the emissions equipment to start testing the Chevy 1500 on the dynamometer. SCE engineer Ed Kellogg (left), assisted by Luis Godinez, sets up his computer program to measure data from the converted Chevy 1500 while the dynamometer simulates road conditions. The Chevy 1500 converted to plug-in hybrid electric is put through its paces at SCE’s dynamometer in Pomona. Ed Kellogg, an engineer in SCE’s Advanced Technology group, plugs in a converted Chevy 1500 before testing it on the dynamometer at the lab in Pomona. SCE is testing this van, which was converted to plug-in hybrid electric, at its Advanced Technology lab in Pomona. The vehicles could offer more fuel-efficient and environmentally friendly choices for commercial use. When the Chevy Volt plug-in hybrid electric first came out in 2010, it seemed like the answer to motorists’ dreams — a car powered by electricity and gasoline that combined high fuel economy with more range than all-electric alternatives. Now there are about 20 plug-in hybrid electric cars on the market, but trucks and vans have been missing from the plug-in hybrid electric scene. That could be ending with completion of a $95.8 million U.S. Department of Energy demonstration project. During the project, utilities, municipalities and companies across the country and Canada tested 296 plug-in hybrid electric half-ton pickups, passenger vans and heavy-duty trucks for commercial use. The project’s goal was to develop three production-ready, plug-in hybrid electric powertrain systems to be installed as conversions on medium-duty vehicles. 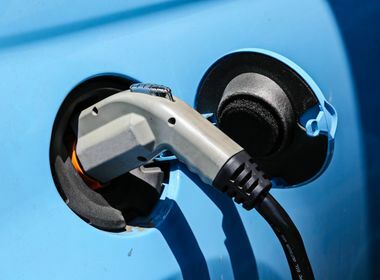 The hope is the project will prompt enough commercial sales to utilities and companies to decrease production costs and, ultimately, spur automakers to produce hybrid electric plug-in pickups and vans for the motoring public. Southern California Edison’s Advanced Technology group did testing for the demonstration project at the utility’s dynamometer facility in Pomona. The dynamometer provides data on how the vehicles perform in simulated road conditions. SCE also is testing three of the demonstration project vehicles — two plug-in hybrid electric vans and a pickup — for its own fleet. Ed Kellogg, an SCE engineer working on the demonstration project, currently is prepping the pickup truck for field testing. The pickup began life as a gasoline-powered Chevy 1500 and then was converted to a plug-in hybrid electric. The truck has several potential advantages. It can go 35 miles in all-electric mode and then kicks into gasoline power for a total range of about 230 miles. SCE’s crews usually drive short trips, so the truck will run mostly in all-electric mode, running cleaner and saving gas. Crews also can use the battery to run the air conditioner and replace a 120-volt generator. That improves safety by reducing noise at the worksite so workers can hear each other better. It also makes the truck quieter working in residential neighborhoods while cutting gas emissions and still providing air conditioning for crew safety. “The big question is whether this would be cost-effective to put in the fleet,” Kellogg said. The cargo demonstration van is now in use at SCE’s regional warehouse in Westminster. 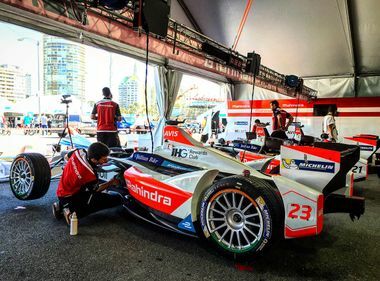 Kellogg expects the plug-in hybrid electric testing to continue through the end of the year when SCE will determine what changes need to be made to better adapt the vehicles to the utility’s needs. “This is really version 0.5,” Kellogg said. 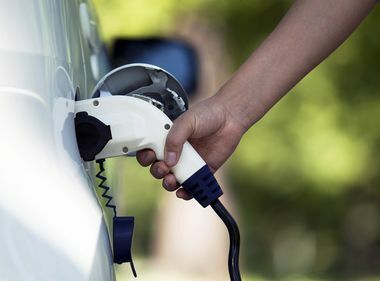 He thinks the project could play a role in SCE’s commitment that a minimum of 5 percent of its fleet purchases be for plug-in electric vehicles, plug-in hybrid electrics and plug-in battery modules. Currently, about 530 vehicles in SCE’s fleet are electric or hybrid electric. The company’s support for the plug-in electric hybrid demonstration project has won recognition from the electric industry. The Electric Power Research Institute recently gave SCE a Technology Transfer Award for the testing it is doing. “SCE’s participation with five other utilities in EPRI’s Plug-In Hybrid Medium-Duty Truck Program helped bring new electric trucks to Southern California and also added to a national fleet of electric utility service vehicles,” the Institute said.